Heat oven to 325°F. Spray 8 (6-oz) glass ovenproof custard cups with cooking spray. In small bowl, mix cracker crumbs, 2 tablespoons sugar and the butter. Distribute evenly among cups (about 2 tablespoons in each). Press with back of spoon. To minimize cracking, place shallow pan half full of hot water on lower oven rack. Meanwhile, in large bowl, beat cream cheese with electric mixer on medium speed just until smooth and creamy; do not overbeat. On low speed, gradually beat in yogurt, 2/3 cup sugar and the vanilla. Beat in eggs, one at a time, just until blended. Pour about 1/3 cup on top of crust in each custard cup. Place custard cups on cookie sheet. Bake 30 to 35 minutes or until edges are set. Turn oven off; open oven door at least 4 inches. Leave cheesecakes in oven 10 minutes longer. Remove from oven; place on cooling rack. Cool 30 minutes to 1 hour before serving. Top each with a sliced strawberry or any other fruit. Store cheesecakes covered in refrigerator. Make sure the cream cheese is softened before beating. This makes it easier to blend with the other ingredients. Use any desired fruit or topping for serving these delicious cheesecakes. If you have a 13x9-inch pan, place cheesecakes in it before baking. Pour hot water in the pan (filling pan less than halfway), and continue as directed on step 3. No-hassle individual cheesecakes! 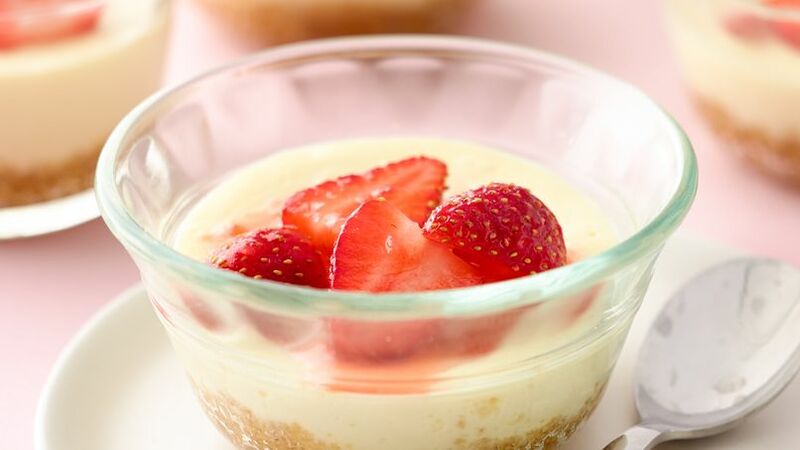 With Yoplait® Greek yogurt, these cheesecakes are very easy to make and a delightful success for any special occasion.